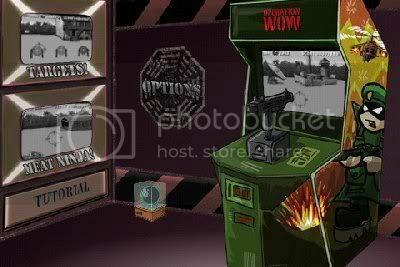 by PaulEMoz in "Ivanovich Games", "Operation WOW", "Operation Wolf", "iPad", "iPhone", "iPod Touch"
If you played arcade games in the Eighties, the chances are that at some point, you played Operation Wolf. 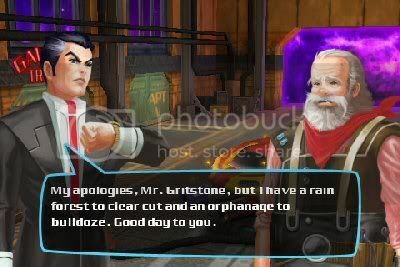 Whether it was on the giant arcade machine, with its massive front-mounted guns, or on one of the excellent home ports, you've probably heard or seen the words "Sorry, but you are finished... here". Oooh, my very own arcade! That's quite a lot of hardware to be up against. And I'm very glad that I started off that download, because Operation WOW is really good. 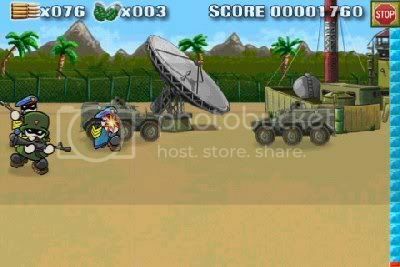 In fact, it IS Operation Wolf, albeit with much more cartoony graphics. Other than that, the levels are the same, and I think that even the layouts are the same. They certainly look familiar. 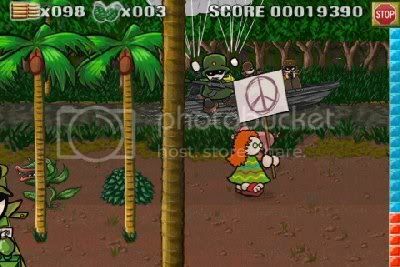 The aim is the same as ever... blast your way through six levels to rescue the hostages/POWs/whatever they are. Different environments pose different problems, but mainly, you're blasting soldiers, tanks, boats and helicopters, and all the while they're assaulting you with whatever they can throw at you. Ooohhhhh... you'd love to, wouldn't you? I was both heartened and amused to find that even the comedy touches had been retained for things like extra weapons pickups... shooting indigenous wildlife such as pigs or buzzards will see grenades or bullets left behind. I'd rather have bacon, but in this game you take what you can get. The developers have even thrown in a couple of mini-games, just in case the main game isn't enough for you. 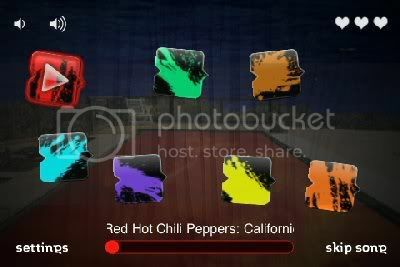 There's a target shooting game, where you need to clear all the targets as quickly as possible while avoiding the red herrings. 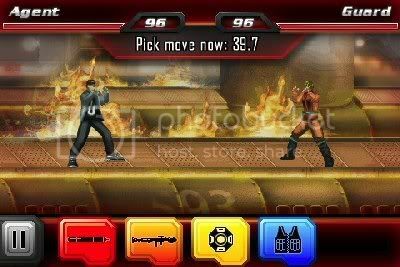 And there's an amusing little effort called Meat Ninja... which is the same as well-regarded iPhone game Fruit Ninja, except that different meats are thrown in the air and you have to blast them. Funny. They've shot me! THROUGH THE FACE! Operation WOW is a splendid effort, even if it is a throwback to a different era. 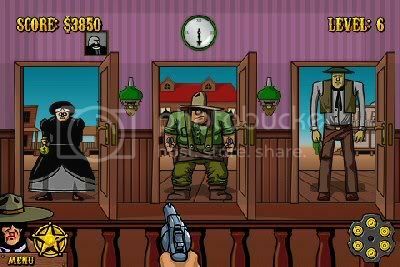 The cartoony graphics do make a difference in bringing it up to date, but other than that, this is the same classic game that you remember from the past. For free, it's excellent, and if you like arcade gun games then you really ought to download this right now. Advent Calendar - December 15th. by PaulEMoz in "Fifteen", "iPhone", "iPod Touch", "puzzle", "sliding blocks"
Sorry folks, you're not getting much out of me with this one. I tried to find something decent for today, really I did. 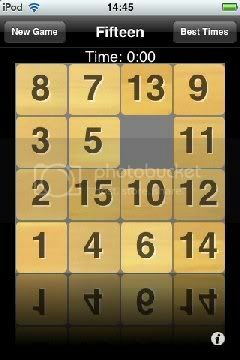 Fifteen is a sliding block puzzle. You have a 4x4 grid, with fifteen numbered tiles and a space. You shuffle the grid, and then waste hours of your life trying to get them back in order. That's it. No thrills. No surprises. I used to quite enjoy playing with a plastic one of these at my grandmother's house. But that was thirty years ago, and those were simpler times. Now, I really can't be bothered. I haven't got the patience any more. 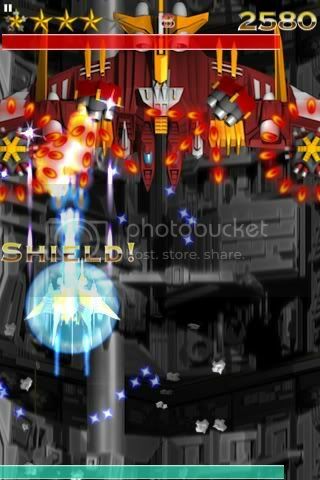 by PaulEMoz in "Phoenix", "bullet hell", "iPhone", "iPod Touch", "shmup"
"Hey! ", I thought, when I saw the name Phoenix on my iPod. 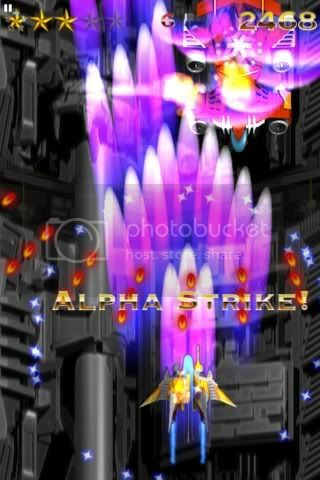 "Taito must be releasing a series of arcade classics on the iPhone. Fantastic!" 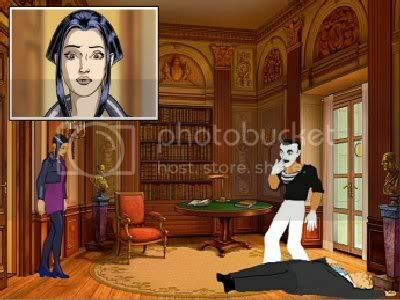 Then I saw the screenshots and realised it was not Phoenix from the arcades at all, but an entirely different game. Swizz! Die, alien scum! That was a bit predictable, wasn't it? It's a little bit naughty giving a game an already-well-established name. It's a bit like forming a rock band now and calling them The Human League, or something. Except you'd get killed for that, obviously. 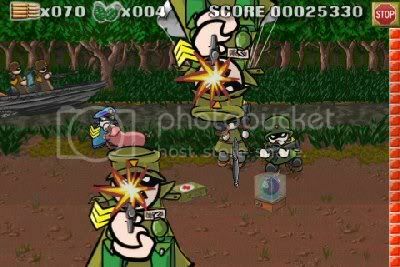 Still, on second glance I noticed it was actually a shooting game... not only that, it looked like a bit of a bullet hell affair. So I checked the requirements... I'd been very keen to buy Espgaluda II, but I've got a first generation iPod Touch and (disappointingly) that game won't run on the 1st gen models. But all was well... Phoenix runs on everything. A shield! Nice. Now I can get in there and really give them what for. If you look Phoenix up on iTunes, the lack of any kind of storyline is both hilarious and refreshing. There are no pretentions here: you just fly up the screen and shoot everything. Great. Phoenix has got a typical iPhone control method. You slide your finger around the screen to move your ship, which fires by itself. Your ship is quite big, and this makes it quite easy to control. In fact, out of all the shooters I've played on my iPod Touch, this is the one I've had least problems and most joy with when it comes to the controls. Now we're talking! Come on, I'll take you all! Although your ship is big, the hitbox is not, so with careful manoeuvring you can steer your way around most of the bullet patterns that are thrown your way. That means it's quite easy to concentrate on blowing stuff up. I love blowing stuff up, and Phoenix really does do it pretty well. Ships of various sizes stream down the screen, and you blow them up. Various pickups will appear as you shoot stuff, ranging from shields to weapons upgrades to special attacks. When large ships are destroyed, any bullets that remain on the screen will be converted to bonuses, which automatically flow into your ship to add to your points total. It's a familiar mechanic, but no less enjoyable for it. Ahh, that's the stuff! Now, I am eeenveeenceeblllllle! Any possible disappointment that this isn't the 1980 arcade game is quickly washed away in a hail of bullets. Phoenix is a nice, if repetitive blaster, which I've enjoyed quite a bit so far. It certainly isn't on the level of quality or complexity of the Cave shooters, but on the other hand that could be quite a draw to a number of people... sometimes it's too frustrating to have your backside kicked to Kingdom Come. 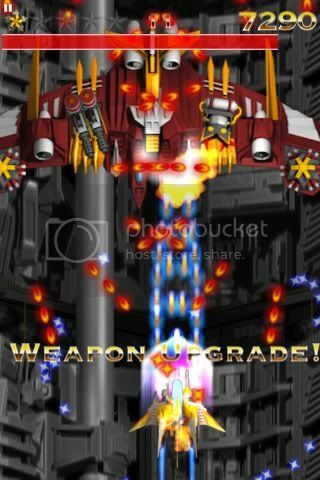 If you've got a first generation iPhone or iPod Touch and are missing out on Cave's games, or feel like dipping your toe into the waters of bullet hell shooters, Phoenix will fit the bill very nicely indeed. by PaulEMoz in "Game Dev Story", "Kairosoft", "Sims", "iPhone", "iPod Touch", "management"
If you like to keep up to speed with the games industry as a whole, rather than just play the games it churns out, then you'll probably be aware that a fairly alarming number of games development studios are closing down these days. To the casual observer, this might seem a bit odd... all games sell millions, so developers must be bathing in money, right? Not so. Maybe you'll understand the situation a little better if you play Game Dev Story. Five? Great! Send 'em in! First things first. You can't knock out a game with just your secretary for help... you're not Jeff Minter, after all. 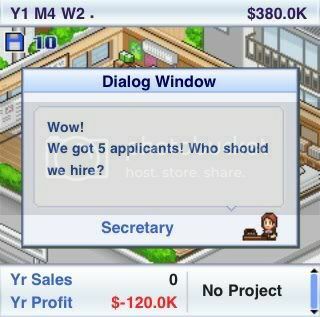 Nope, to get anywhere in this game, you're going to have to hire some staff. Fortunately they're queueing up to work for your fledgling company. The difficulty comes in hiring the right staff. You're not going to get the best on your limited budget, but if you hire for their potential, you can train them over time and hopefully develop them into award-winners. Having said that, there may be times when they're not quite up to the task at hand. No fault of their own... it's just inexperience. When this happens, you can give your project a boost, either by using items in conjunction with your research data, or by contracting some aspect of the work to a specialist outsider. What you have to bear in mind is that these things all cost money, and until you have a hit on your hands it's in limited supply... so choose wisely. 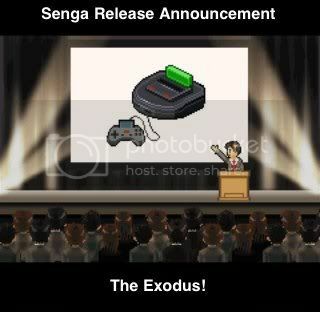 Once your game is finished, it's time for the release. It'll help if you pay for advertising at this time... you need as many people to know about your game as possible. Then you can sit back and watch the sales mount up. Or can you? It doesn't pay to sit around, and while your staff might be a bit burned out to be considering anoher game, you can take on other projects to keep funds ticking over, such as creating scenarios or sound FX work. There's always plenty to do. This all sounds a little bit dull, but it isn't at all. It's entertaining... interesting, even, to see how this game industry works. And it helps that it has a nice sense of humour. The game is littered with cute little references, and the best thing is they tie in (somewhat) with real gaming history. So if you know your consoles, you should be able to figure out which ones to throw your weight behind in the game... and which ones to avoid! Damn! We were hoping for the Dreamcost 2. I've seen a lot of reviews that complain about the graphics... that although the style is nice, the iPhone is capable of better. I think that's missing the point. Just because "better" is possible, it doesn't mean it's suitable. The pixel-art style this game employs fits really well, and that's much more important than adding extra flash. Similarly, there are complaints that the game doesn't fill the whole screen. If this affected gameplay, fair enough... but it doesn't. To me, Game Dev Story has very cute graphics that fit perfectly... that'll do for me. Hurray! What a bunch of stars we are! If there's one game that Game Dev Story reminded me of, it's Rock Star Ate My Hamster, which I played back at the beginning of February. It has the same reliance on hiring the right people, making the right choices regarding work and advertising, and some nice subject-related humour. That also means that there's a chance the repetitive gameplay will become stale over time. And with the relatively expensive (for the iPhone) £2.39 price tag, some might not feel like taking on the risk. Personally, despite my usual apathy towards resource-management games, I've fallen for the charms of Game Dev Story, and it's a very welcome addition to my iPod Touch. 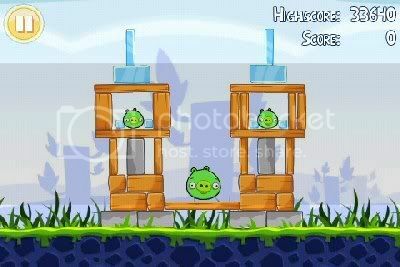 by PaulEMoz in "Angry Birds", "Boom Blox", "Crayon Physics", "iPhone", "iPod Touch", "puzzle"
There really isn't much that needs to be said about Angry Birds. I loved it when I first played it, and I still love it now. IT's become something of a phenomenon, though, pretty much taking the world by storm. There's about eight of us in my office that have Angry Birds, and the great thing is, it appeals to all kinds and all needs. The OCD gamers have had an amazing time, blasting through all the levels and feeling a compulsion to three-star the lot. That takes some doing, too! But those that have less time on their hands can just play two or three, or until they get stuck, and then put it down again. It really is a genius piece of design. A level can last ten seconds or, if you get stuck, an absolute age. But they can always be figured out, and you can fit sessions into almost any spare time you might have. 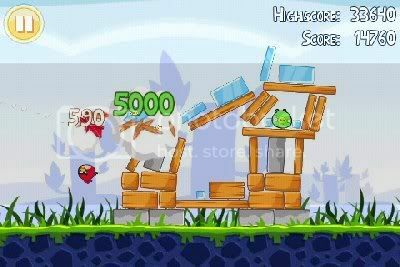 Since I first played Angry Birds, an update has been released, which adds even more levels to the game, plus a couple of extra little features. It was fantastic value for 59p before, but now there's absolutely no excuse for anybody not to own it. Unless they don't own an iPhone or an iPod Touch. That'd do it. by PaulEMoz in "Alien 3. 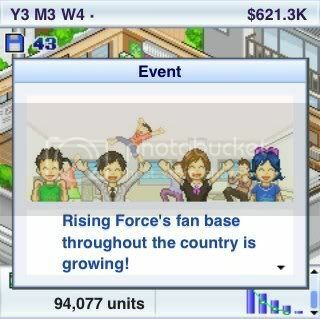 Acclaim", "PS2", "The Red Star", "XS Games", "iPhone", "iPod Touch"
If ever a game deserved a bigger audience, it's this one. 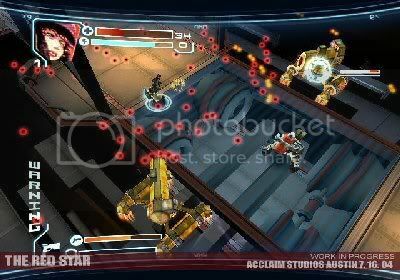 Having survived the sort of development hell that would usually see a game brutally killed off after most of the hard work had been done, The Red Star battled its way into the shops to glowing reviews and, seemingly, not much else. Well, have YOU played it? Not many have, which is a real shame. I've bought this twice... the first copy, I traded in (sealed) at Gamestation and was gutted to see they'd given me a quid for it. What a waste. I did, though, manage to pick it up again at Game for £2.98, which is excellent value and I'm not getting rid of it this time. Based on a graphic novel (no, I haven't read it), it's a really imaginitive shoot 'em up, with elements of Alien Syndrome, Smash TV, Contra, bullet hell shooters and a few other games thrown in for good measure. It takes those games, ramps them all up to eleven, throws in some thrilling setpieces and surprises, and really makes you want to keep playing, not just to see what it'll throw at you next, but also because you're enjoying it so much. 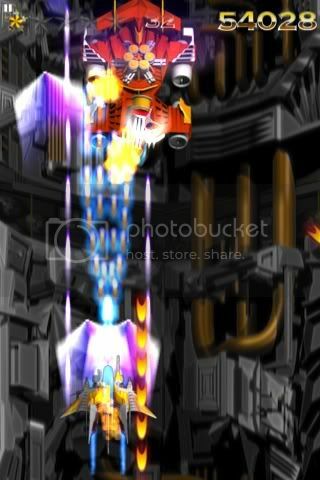 This just reminds me of how much Ikaruga kicks my arse. Playing it again has given me an even greater appreciation of the game. And there's some possible good news... it's been released on the PSP, and it seems that an iPhone/iPod Touch version is in the works with a release imminent. I hope they do a good job, because the game deserves more exposure, and more love. Oh, and there are three instalments of the graphic novel on the App Store right now... for free. Just search for The Red Star. I'm really glad I spent that three quid at Game to get The Red Star for a second time... it's a fantastic shoot 'em up that's more than just that, and gives a guaranteed great time. I would still highly recommend you get this, if you have a machine that will play it. It's hugely deserving of its number nine spot on my list. 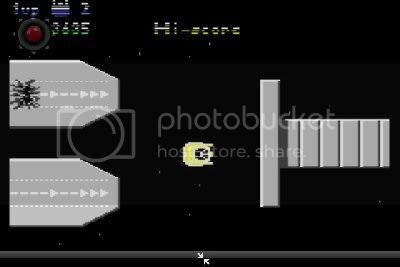 by PaulEMoz in "Commodore 64", "First Star", "Hewson", "Wizball", "iPhone", "iPod Touch"
I've been a fan of the Commodore 64 for nearly twenty-five years now. The original machine is best, of course, but I welcome any new opportunity to play its games on new platforms. 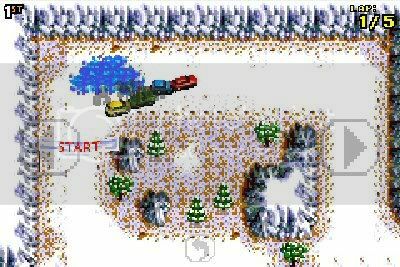 Emulation has seen old computers raise their heads all over the place... not just on the humble PC, but for years and years now they've been running on systems from handhelds up to the Nintendo Wii. Now, it's running on the iPhone... sort of. 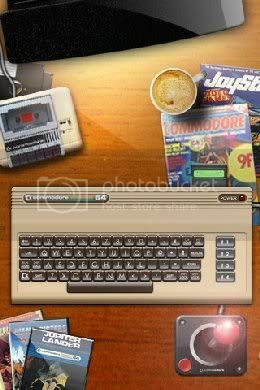 The program is set out in a cute way, with a Commodore 64 in the middle, tape deck at the top left, cup of coffee and computer mags at the top right, joystick at the bottom right and games at the bottom left. This is purely cosmetic... after a little while, a power button pops up for you to start the program. Once you do, it displays your list of games, plus options at the bottom. Games... it appears that someone has managed to officially license some Commodore 64 games for sale on the App Store. They get around the usual restrictions by offering them through an in-emulator store. It works perfectly well, although there's not a lot of games available just yet. Most of the games are from Hewson (not a bad thing), with a few First Star, Task Set and Mastertronic games also available. Oh, and Wizball. You don't need to head in that direction immediately, because they do throw some free games at you for starters. At first, I thought that the eight Commodore games they give you were your lot... not bad, as the classic International Soccer and Basketball are among them, as well as Jupiter Lander and Jack Attack. But then I noticed there were others in the store for free, and all I had to do was download them. And there are some bona fide classics in there... Bruce Lee for one, Samurai Warrior (Usagi Yojimbo) for another. There are a couple of Jeff Minter games (Hover Bovver and Attack of the Mutant Camels), which is good to see. There's also Laser Squad, which would seem to be an awesome addition... although I can't figure out the controls for that one at all. That's what you get for trying to be sneaky! The controls... that's where the whole package lives or dies, really. And although I don't want to say that this dies, it's certainly a bit peaky. The level of control you get depends on the type of game you're playing. The first game I played was Bruce Lee, or B. Lee as it's actually called here... I guess your character could be Bernard Lee, or maybe Brett Lee, but that's a bit less glamorous in a kung-fu game. I didn't play this much at the time, and never really knew what I was supposed to do. My mate Reedy played it loads though, and loved it. Actually, I remember now that we had some good laughs with the two player game. He might not have been so keen on this one... it's pretty tricky to do what you want. The problem mainly comes from the "joystick"... the length of travel is too long, making movements imprecise. In B. Lee, that means The Green Yamo keeps kicking me to Kingdom Come. Not great. 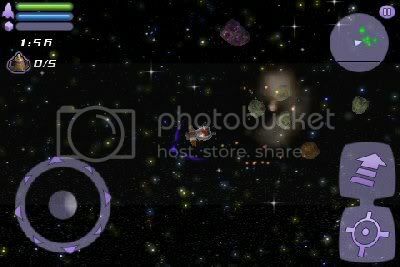 Games can be played in Landscape mode, which is probably a bit easier. Next up was Usagi Yojimbo. 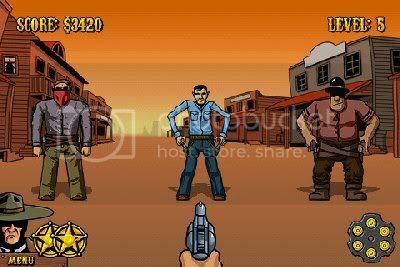 I loved this game back in the day. Loved it. In fact, I might do an Unsung Classic on it. For a samurai game, and therefore a beat 'em up, it's quite laid back. As a result, it actually works pretty well on this app. Everything came flooding back straight away, and I didn't have any control issues at all. This could eat up some time. Finally, in order to test the shop and the joystick's true limits, I downloaded Uridium. Uridium was possibly the best arcade shooter on the 64. Fast and frantic, it requires quick reflexes and a quicker trigger finger. Which means that on the iPhone or iPod, you're dead in no time flat. You just don't have the level of control that you need over your ship. Shame... this would have been an awesome game for the bus. And this is full screen mode. Now, where's the "accurate controls" mode? 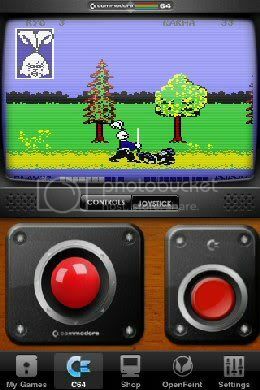 At the end of the day, recommending this Commodore 64 app is difficult. After all, the C64 has been emulated on countless handhelds, to better effect. But this does have some nice features... one of which is the way it automatically saves your game when you exit and gives you the option of resuming where you left off next time you load the game. It's a nice idea, but the controls still need some tweaking. 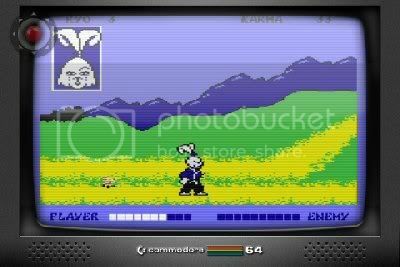 That said, it's free (not sure if that's permanent or not), and as Usagi Yojimbo is also free and is awesome and playable here, it's worth getting just for that. Anything else you happen to like is just a bonus. by PaulEMoz in "DrawRace", "Ivan Iron Man Stewart", "Revs", "Super Sprint", "iPhone", "iPod Touch"
I was at a bit of a loose end today, and somehow I ended up on my iPod, browsing the App Store. Eventually, I happened upon Revs!, which was a 59p racing game, and so I impulse bought it. 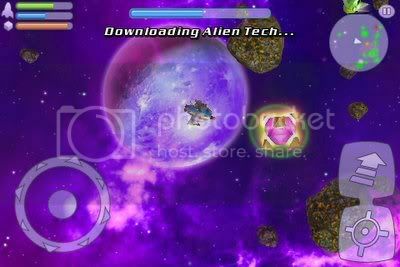 It's a typical Super Sprint/Ivan Ironman Stewart-type game, something which seems to be becoming increasingly popular on the iPhone/iPod Touch. You get a choice of four cars, but all this boils down to is that you get a choice of your favourite colour, as they all look the same and they all have identical abilities. There's also a choice of two game modes: championship and time trial. I'll look at the championship first. Once your game gets under way, it's you against the other three colours in a five lap race. The championship consists of eight tracks, and you score points for a top three finish... but if you come fourth, you're not allowed to progress. Harsh, that. Mud, mud, glorious mud. Nothing quite like it for slowing your car down so you finish last. Should you make it through all eight tracks, there may be more. I don't know, because my accumulated points total saw me finish fourth, and I was told that a top three finish was needed to progress. So even though I never actually finished last, the others swapped positions enough to see me cumulatively last. Bastards. It's very difficult to do better, too. I did win the first race, and managed second in the next, but I was third every other time. Your car isn't fast enough to outpace the opponents at the beginning, so you'll always see two cars streaking away into the distance. You can collect coins on your travels, and at the end of each race you'll get the chance to upgrade. But to be honest, I never noticed any difference from race to race in the performance of my car. And as overtaking can be as difficult here as the Valencia Formula One track. It's like Wacky Races, except all the cars are broken from the start. Time Trial can be a promising game mode, with a constant challenge to your own times being an addictive element of any game. Here, however, I was foiled in my attempts at fun. The game provides you with a ghost car, which is nice and gives you something to shoot for. Also, the cars now have different attributes, so you can pick one according to your driving style. But it also only unlocks one track for you, and to unlock the next you have to beat a pre-determined time... which I was unable to do! So I was left trundling around the same track, wondering where the hell I could shave off the second-per-lap I needed. Revs! is actually a decent little app for 59p. 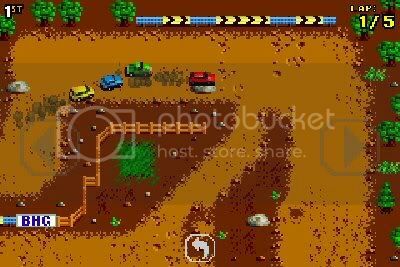 It looks almost exactly like a Commodore 64 game, and is similarly old-school in gampeplay, with the cars having eight fixed positions as you turn. It never feels exciting, though, and is definitely hampered by its harshness. You might want to give it a go for that price and for the nostalgic feel... but you'd probably be better off going with DrawRace instead. 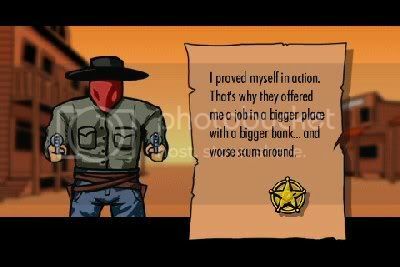 by PaulEMoz in "Sword and Poker", "card fighting", "iPhone", "iPod Touch"
For years, I've ridiculed the idea of videogames where you use cards to defeat your enemies. I've tried to play a couple of them, and hated them. I've called them stupid and pointless, among other things. And then I went and played Sword & Poker. 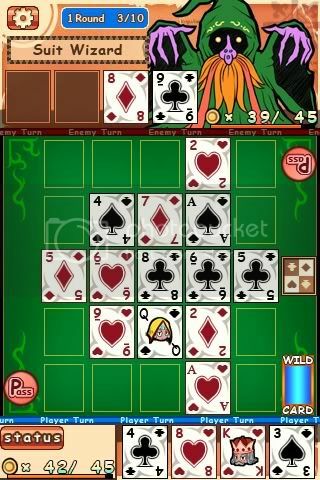 Sword & Poker is something of a dungeon crawler. It's not like Dungeon Master, and it's not like the Diablo games. Instead, you're shown a top view of a dungeon level, with you starting at the beginning, and a pathway to the end. 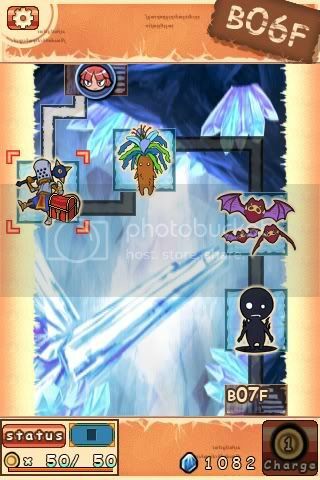 Along the way are a series of monsters, which you must defeat to get to the end of the level. 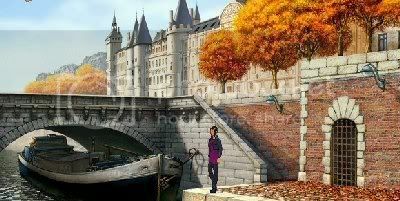 You can't go around them, although there are times when the path branches so you can choose which fight to take. But basically, you'll have a set number of fights to win in order to get to the next level. If your energy runs out before you get to the end, you've lost and will have to restart the level. Ready... FIGHT! Erm, DRAW! Snap? Damn. When you do encounter an enemy, you face off using a five by five grid. Nine cards are placed in the centre of the grid... you will then be dealt four cards, and you must place two of them on the grid to make the best five-card poker hand that you can. Each hand causes damage to your enemy. Cleverly, it doesn't always work out that the strongest hand causes the most damage. That's the case with your starting weapon, but as you earn money you can buy new weapons at the end of every level, thanks to the handily placed shop. Some weapons have magic properties... others sacrifice damage with stronger hands in order to make some of the mid-level hands do more damage. So you might only hit for one point of damage for a straight flush, but you might hit for thirty for a full house. It's an interesting element of strategy, because those premium hands don't show up all that often. You'll do best if you take stock at the end of every level, see what you can afford and look at how much damage each weapon can do, and whether certain trade-offs are worth it. Sword & Poker is a very simple idea, and one I'm sure has been used many times before but that I've been too blinkered to see. I've learned a lesson with this game... although an idea might be stupid (which I still think the fighting with cards thing is), it doesn't mean it won't be enjoyable. You won't see me rushing out to buy more card fighting games, but I've learned not to be so ignorantly dismissive. Say the words "physics-based puzzle game" to me, and I'll more than likely run off screaming, as fast as my not-so-little legs will carry me. On the odd occasion, though, something will come along that's just engaging, charming and entertaining enough to grab me. Angry Birds is one such game. Angry Birds is, on the face of it, ridiculous. It's got a hilariously stupid premise, which is very endearing. 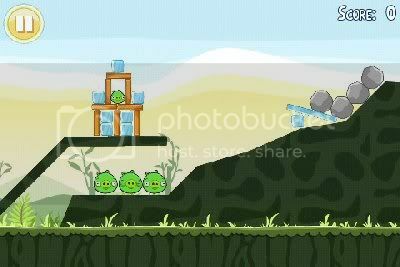 Green pigs have stolen the birds' eggs, and that has made them angry. They want revenge. How do they get it? By, in true fairytale fashion, blowing the pigs' houses down. But they don't huff and puff, oh no. They launch themselves from catapults, knocking over any structures in their way before exploding in a final coup-de-grace. So, feathered friends... how do we take out this building? This is the kind of imagination that has led to the games industry being so varied. I love that idea, and I love the angry scowls on the birds' faces as they line up, waiting to be flung at great speeds towards wood, brick, glass and pork. Tremendous. The game has a lot of levels, and a little bit of depth, too. As you progress, other kinds of birds become available for greater destructive potential. There's some trial and error in the gameplay... you're unlikely to get many efforts right first time. It's a bit like Worms in that respect... aim and fire, then adjust for your next go and hope to hit the mark more accurately. There's high-scoring potential here, too. You get points (seemingly) for accuracy, and for the things you blow up, and there are bonuses for the number of birds you have left at the end of each screen. You're ranked for each effort too... anywhere from one to three stars for successfully completing the screen. Yet another way to draw you back into the game. 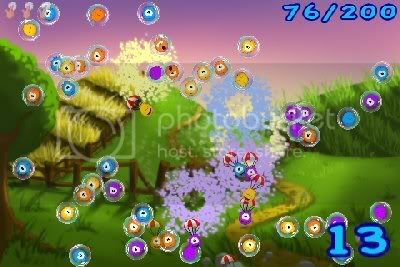 I've said it's like Worms... it's also, basically, a 2D version of Boom Blox, that great Wii game. Maybe more of a cross between the two... either way, I'm enjoying it a hell of a lot, which is something of a surprise to me, and a very pleasant one. by PaulEMoz in "Sneezies", "fireworks", "iPhone", "iPod Touch"
I'm bloody hooked on this thing. I've got a workmate to blame for the addiction. She got an iPod Touch for Christmas, but didn't have broadband until a week ago. And one of the first things she downloaded was Sneezies, which she naturally wandered over to tell me I had to download. So I did, and I might as well have just injected crack into my eyeballs. Thanks, Jane. The object of Sneezies is simple. The Sneezies are cute little creatures, which float around the screen in bubbles. You get to touch the screen once per level, and when you do, you release a small cloud of something that irritates their little noses, causing them to sneeze. When they sneeze, their bubble bursts in a colourful cloud, and they parachute to the ground. That colourful cloud will irritate any other Sneezies within range, causing a chain reaction, hopefully big enough to meet your objective for the level. And that's it. Very simple, and stupidly addictive. There are three different game types: Classic, where you simply have to meet the specified target on each level; Challenge, where you have a certain number of touches to meet your objective, and Score EX, which is a high score mode. Each mode offers something different, fun and addictive. An added bonus is that when the bubbles burst, it creates something of a firework display on your screen. It's a nice little visual... in fact, the whole game is very nice to look at, and sounds cute too. But it's all about the playability, and Sneezies is overloaded with that one-more-go hook that'll never let you go. For only 59p, this one is almost impossible to resist. by PaulEMoz in "007", "James Bond", "Top Agent", "iPhone", "iPod Touch"
If Quantum of Solace was a shooting gallery, 007: Top Agent reduces spying to a game of rock, paper, scissors. I knew right away this would be bad. When would Bond ever wear trainers and a baseball cap? Each screen sees you on one side and an enemy on the other. 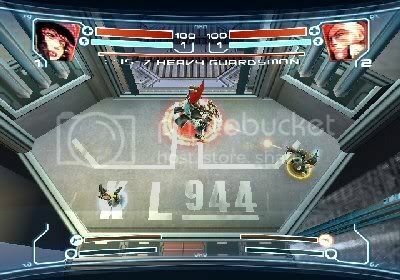 You have icons at the bottom of the screen, representing available moves. You pick one and your opponent picks one, and then the moves are acted out for you. Get lucky with your pick and you'll score a substantial hit... otherwise you'll miss, and likely take damage yourself. You can increase your stats by earning points, and buy weapons and armour with money. Points and money are usually awarded after each fight. I'm not going to say much more than that... the game really isn't worth it. It's only a Bond game by virtue of the "007" in the name and the fact the four levels are based on Bond films. Everything else about it is poor. 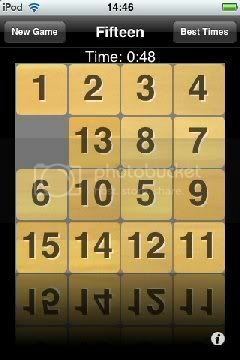 by PaulEMoz in "Audio Puzzle", "iPhone", "iPod Touch", "music app"
I was a bit disappointed with this one. It sounded pretty good from the description... it would take my music from my iPod and cut it into puzzle pieces, which have to be fitted back together in the right order to "win". On paper, that's a great idea. In practice, it doesn't really work. For a start, it only chops a tune into six or seven pieces, which is not really enough to be interesting. Also, you either know the song or you don't. If you do, from that number of pieces, you should win every time. If you don't, there's not really any fun in guessing what should come next, and anyway, if you've got any kind of musical brain you should fathom it out easily. Bit of a shame, that... it was only £1.19, but I could have used that on an app I might have had more interest in. And with there not being a Lite version... well, I kind of fell for the description too easily. Doubt I'll use it again, to be honest... it's neither nowt nor summat. 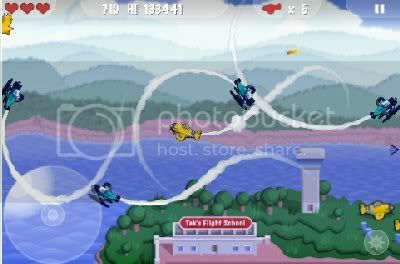 by PaulEMoz in "Mini Squadron", "dogfights", "iPhone", "iPod Touch", "planes", "shmup"
I got this as part of the appvent calendar, an initiative that gave away a different iPhone/iPod Touch game every day in December up to Christmas Eve. I'm all for free stuff, especially games, as it extends the potential lifespan of this blog even further. I'm especially for free stuff when it turns out to be good. Mini Squadron is a pretty impressive little horizontally-scrolling shmup, which sees you going backwards and forwards and looping-the-loop over a fairly small tract o' land, downing enemy aircraft until a level is complete. It's more or less as simple as that. What's good about it is that there are loads of unlockable planes (56, in fact! ), meaning that there's a heck of a lot of game in here for what is essentially a simple shooter. Look, pretty patterns! Shoot the planes, and you'll see black smoke. Better for you. It also controls pretty nicely. Circling your thumb around is enough to have you swooping and spiralling around the skies quite gracefully. It plays very, very nicely. It actually reminds me of an old Commodore 64 game called The Island of Dr. Destructo... with some Time Pilot elements thrown in. Throw in some fun extra weapons and you've got yourself a cracking time. If you played it non-stop it would take you at least five or six hours to complete, probably more. I reckon that's easily enough to justify its £1.79 cost, but seeing as I got it for free, I'm extremely happy. There's a Lite version available... give it a try.